I just found this image from summer and I think it perfectly illustrates how most of the guerrilla campaigns in Prague looks like (this one with parrots being for Prague ZOO). The agencies use tram stops. 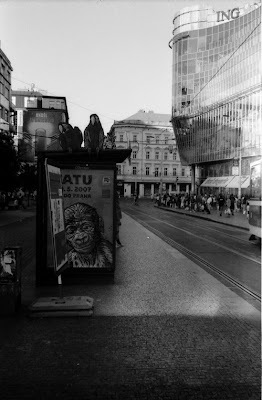 Well, if I have to spend money on advertising in Prague, I would use tram stops too. The second step would be the ads on trams.